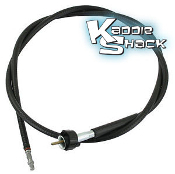 This metal guide tube protects the throttle cable as it enters and exits the Type 1 fan shroud. 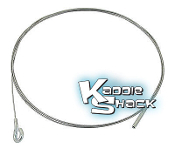 If your hood release cable is damaged or broken, it can be a real pain! Replace it before it finally snaps and leaves you without access to your fuel tank! If your hood release cable is damaged or broken, it can be a real pain! Replace it before it finally snaps and leaves you without access to your fuel tank! The tube that guides it is sold seperately. 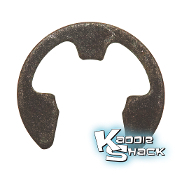 If your barrel nut connector from your carb to your throttle cable is siezed, stripped, or lost, this is a great quality replacement. It is also used to connect the heater control cable to your heater box lever. Quality replacement clutch cable. It's always a good idea to have an extra one in the glove box... just in case! Often, we find it necessary to replace the wing nut at the same time, as they get rather worn and bind. The clevis clip will likely also need replacement, as they tend to break. Quality replacement clutch cable. It's always a good idea to have an extra one in the glove box... just in case! Often, we find it necessary to replace the wing nut at the same time, as they get rather worn and bind. The clevis clip will likely also need replacement, as they tend to break. This is the little clevis clip that holds the clutch cable in place on a Type 2. Since they are a small part and exposed to the weather, it is common for them to break. It's always a good idea to replace this part when replacing your bus clutch cable, and not a bad idea to have an extra one on hand. This is the little clevis clip that holds the clutch cable in place on a Type 2. Since they are a small part and exposed to the weather, it is common for them to break. It's always a good idea to replace this part when replacing your bus clutch cable, and not a bad idea to have an extra one on hand. Have a broken parking brake cable? Here's a quality replacement. It's probably a good idea to do both sides if you're in there already.